CHECK OUT OUR VIDEO JUST BELOW THE CALENDAR AT THE BOTTOM OF THE SCREEN! NOTE: Ask about our many updates that have been made since the video. We rent a beautiful Lakefront vacation homes in Lake Arrowhead Yacht and Country Club, a private gated community with 24 hour security.. Our featured home is on the lake where you can enjoy relaxing on 2 large double decks with one of the most magnificant views of the lake. The home is right on the lake with a large dock with ample room for swimming and fishing. Our home has four bedrooms (one king, two queens, full/twin bunk bed), three full baths. The house has heat and air conditioning, fireplace, deck with hot tub (has jets and whirlpool), balcony, gas grill, washer and dryer, phone with free long distance in the USA, Wireless Internet for your laptop as well as a huge 60 inch big screen TV, VCR,DVD, and a Foosball/Pool/Airhocky gametable. The fully-equipped kitchen has a dishwasher, coffee maker, free coffee beans/grinder, blender, microwave, paper products, dishes, and pots and pans. Linens and towels are provided. The resort has an 18-hole golf course, country club, newly refinished olympic size swimming pool, and new lighted tennis courts. The championship golf course has 18 holes through the North Georgia Mountains for spectacular scenery adding to the enjoyment of the game. Golf prices start at $29 weekdays and $39 weekends for golf after 3:00 PM. Before 3:00 PM prices are $46 on weekdays and $53 on weekends (includes green fees and cart). They also have special senior rates at $35 Mon-Thurs. Prices are subject to change. There is a marina with boat rentals available on the Lake Arrowhead property! This beautiful lakeside home is nestled in the North Georgia mountains of Lake Arrowhead, just one hour north of Atlanta. Enjoy relaxing on two large double decks with one of the most magnificent views of the lake. Lake Arrowhead is the largest, man-made, privately-owned lake in Georgia. The lake is approximately 540 acres, with a water depth of 80 to 100 feet. Fish include bass, bream, and catfish. 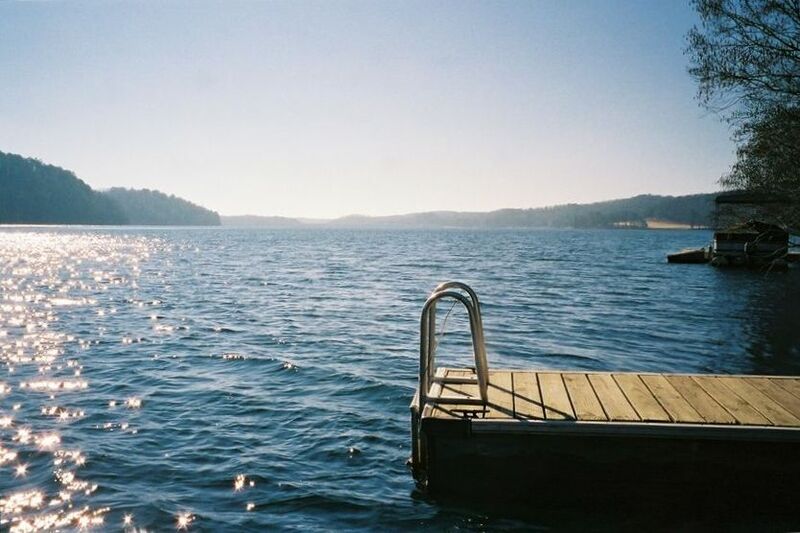 We fell in Love with Lake Arrowhead back in 1999. We loved the lake so much we purchased a empty lot just so we could have access to this beautiful lake. Four years later were fortunate to purchase this wonderful vacation home with another partner. Lake Arrowhead is just one hour North of Atlanta. We live in Marietta, GA and love having the vacation rental home so close. It's a great get away. It's amazing the feeling you get when you enter the property. We think it's the best kept secret in Atlanta. Because we are less than an hour away it's easy for us to keep the house in a great condition! We love all that Lake Arrowhead has to offer: Golf, Tennis, Swimming, Pool, Volleyball, Basketball, Great Festival Park, the Walking Trails. We especially love just sitting on the Deck, Dock or Hot Tub watching the boats go by. THERE ARE A FEW LAKE RENTALS BUT NONE THAT HAVE THESE VIEWS! Check out the lake view pictures! It's right on the lake with a large private deck. Lounge chairs and a complementary paddleboat. 2 Balcony's the full length of the house. Located on the lower deck overlooking the lake. It doesn't get better than this! Our family of 5 had a great vacation on Lake Arrowhead. This lakehouse was in the perfect location on the lake and we had a great time fishing, swimming, boating and just relaxing. The home had everything we needed!!! We spent a week at this beautiful lake house while in the area for baseball tournament. Great location, awesome view and lake was perfect for kids to swim and play in. Highly recommend this lake house. It was exactly what the owner represented. Owner was great and easy to deal with. Serene Lake Retreat - What a View! Want to get away from it all? This is the place. We shared this beautiful lake home with another family. It features a fully equipped kitchen and outdoor grill. We maximized our time outdoors on the balconies and docks. We swam right from the dock; the lake was so clean! I enjoyed daily walks in the neighborhood - two miles of hills was a great workout! The home included a paddle boat. There were board games & even a foosball table for rainy afternoons. The home is located in a gated community that includes a challenging golf course with mountain views, two pools plus basketball courts. They offer club rentals & twilight discounts. My husband was able to squeeze in 9 holes at dusk - it was worth it. The views of the lake from dawn to dusk were breathtaking. We can’t wait to come back to this tranquil retreat. The property is located in an awesome location with a two balcony view an easy access to the water. The property was big enough to accommodate three adult couples. The property has a lot of appliances/dish ware. The house and furnishings are not new but comfortable. The bedrooms are good size with two having their own bathrooms and the third with a bathroom right beside the bedroom. We enjoyed the amenities; golf course, lake/pontoon rental, fishing, and the pool. The wildlife is abundant; deer walking up to the car and a wild boar family walking across the 8th fairway! We all enjoyed our stay and would not hesitate to go back. Thanks for sharing your private lake community with us ! A little outdated but a wonderful place to stay. Owner was great checked in with us made sure things went well. Beds were comfortable. Deck was amazing and we spent the most time there and on the water. For anyone who likes to swim, and have good access, this house will provide. Some of the details for comfort inside the house need updating and work. The owner is working on this as i understand it. Guest suggested more lightning in the living room for reading. Additional lighting was added for future guests. and Swimming, FUN DAY TRIPS TO, Amicalola Falls State Park, a Water Fall perhaps the greatest in the World the most majestic Scene, Amicalola is a state park with walking trails, Kangaroo Conservation Center, Dawsonville, GA - Largest kangaroo collection outside of Australia, Gold Museum, Chestatee Wildlife Preserve & Six Flags, Marietta, GA, Whitewater, Water Park American Adventures Amusement Park, Kennesaw Mountain National Battlefield Park, Trails Tennessee Aquarium, (great trip for a cloudy day), Zoo Atlanta, Don't miss the Giant Pandas of Chengdu! Six Flags Over Georgia and Stone Mountain Park, Home to the world's largest relief carving on the world's largest mass of exposed granite, Stone Mountain Park is often referred to as "the Eighth Wonder of the World, "